Wharfedale is a Freeview Light transmitter so only carries the PSB services as commecrial operators probably deem it uneconomic to provide further services. The transmitter uses Channels 22, 25 and 28. The services on Channel 28 are encoded using DVB-T2 methods to provide HD capability and that needs a Freeview HD capable receiver. If it does not show on your TV then it is not a Freeview HD type. See Which Freeview channels does the Wharfedale transmitter broadcast? for all the details. I have a new LG (led) smart tv .my TV guide only shows the available channels, BBC 1 etc, with no other information about what the channel is, or will be, showing, eg Emmerdale. I have an LG 'smart' TV and it does not show what programmes are currently available nor the schedule for the future programming. It was not designed to do that. Instead, use a widely available TV Listing magazine or the listing given in most daily newspapers. Further, there are probably website that give the schedules for the available channels. David laing: I've just checked my seven year old and relatively basic LG TV, and the EPG does all those things and more! And thats standard on all TV's. 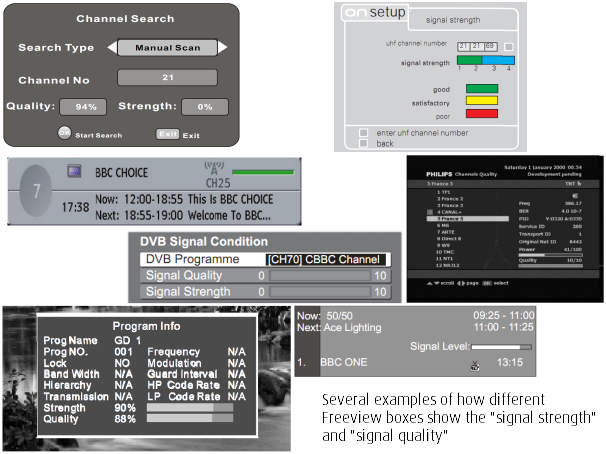 If the EPG isn't populating, check your signal strength - if the signal is low, then that can cause problems. Software can be another problem - make sure there system updates have been done. If you have an LG from this year, there is an excellent chance it has Freeview Play, which slightly complicates matters, since that takes a little longer to load, etc. Check that its accessable to the net. However, you should automatically get the populated EPG/IPG by simply pressing GUIDE, with whats on now, on what channel, and whats next, at least for the next 7/14 days. There should be a small amount of information, but by pressing INFO you should get a lot more - mine tells me bit rate, episode numbers, and of course the ability to switch channels, set up a timer setting, etc. If you guys are not getting this, something is very odd! Mick: ITV3 moved multiplex a couple of weeks ago, so your TV may be stuck with the old tuning data. Try unplugging the aerial and retuning to clear the channel list (make a note of any planned recordings first) then reconnect the aerial and retune again to pick up fresh channel data. Our Freeview signal was never an issue until some months ago, when overnight the screen began to pixelate on all channels. Since then it has become worse and we now receive between 45% and 55% signal strength anda similar quality percentage. We have a communal aerial, but the other five residents have not complained about poor reception. We receive our signal from Sutton Coldfield and for our area it should be a strong signal. Does anyone have any ideas on what could be the cause? Many thanks. You need to check all your aerial connections and cables that you are responsible for. So examine all the cables that you can get at for damage, fraying, etc. Check all the connections especially all the coaxial plugs and sockets. Unplug all of those and refit as that will clear any possible corrosion/oxidation which is a well know cause of problems. Then check that you are tuned to the correct channels for your preferred transmitter, do that by putting your full post code and a house number into the Digital UK Coverage Checker website at Digital UK - Coverage checker and then scroll down to find the listing of the appropriate transmitter. That will tell you the current channels being used and also those planned for the future. You should be aiming for a signal strength of between 60% and 85%. If that is not acheivable, then you need to contact the management organisation responsible for your accomodation to have then get the aerial system checked (each flat is usually fed by separate cables from the common splitter location).